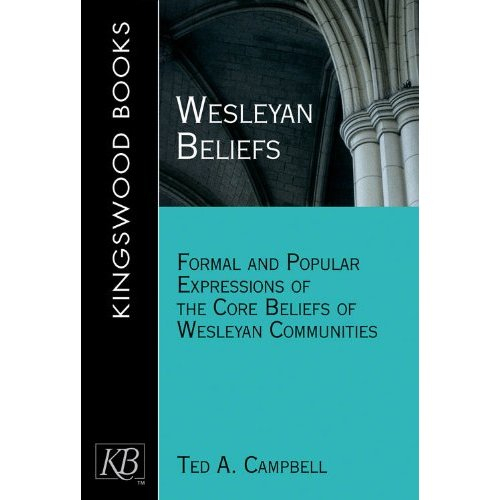 Ted A. Campbell, Wesleyan Beliefs: Formal and Popular Expressions of the Core Beliefs of Wesleyan Communities. Nashville: Kingswood Books, 2010. This books makes a historically documented case for a consistent core of beliefs and practices that have characterized Wesleyan and Methodist communities. It considers not only formally authorized sources (the works of John and Charles Wesley, formal doctrinal statements and catechisms adopted by Wesleyan communities), but popular religious sources as well, including hymns, personal testimonies, and the architectures of Methodist worship spaces. Click here to see Wesleyan Beliefs on the website of the Abingdon Press/Kingswood Books and to order copies of the book. At the heart of this book is the unfolding of a deeply rooted faith grounded in the historic catholicity of the Methodist tradition and interpreted through the lens and narratives of Wesleyan beliefs and practices. With characteristic insight, Prof. Campbell has chosen and discussed many Central Weslyan ideas, in both their formal and popular conceptions, in this very valuable contribution to the dialogue concerning what constitutes the core of the dynamic “Wesleyan tradition” in the Methodist family of churches worldwide. Campbell’s careful study should put to rest finally the frequent caricature of Methodism as unconcerned about doctrinal beliefs. More important, it provides a baseline and model for the continuing study of Wesleyan belief in its many temporal and cultural embodiments. This is a must-read for scholars in the Wesleyan/Methodist tradition and beyond!